Heat oven to 200C/180C fan/gas 6. Put the potatoes in a pan of water, bring to the boil, cook for 5 mins, then drain. Heat the oil in a large frying pan. 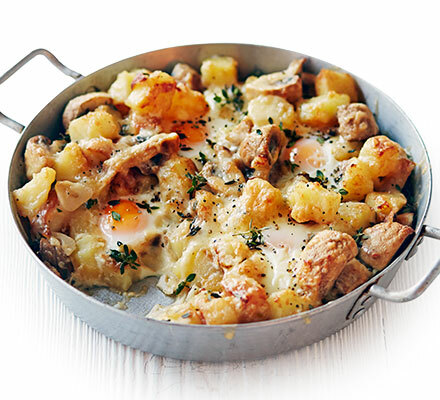 Cook the potatoes, mushrooms and garlic for 5-8 mins to soften the mushrooms and brown the edges of the potatoes. Stir in half the thyme and cook for 1 min more. Spoon the potato mixture into a baking dish and sprinkle with the cheese and the remaining thyme. Make holes in the mixture and break in 4 eggs. Bake in the oven for 12-15 mins until the eggs are set and the cheese has melted. © Copyright 2014 Greenways Eggs - Fresh Farm Eggs (Egg Wholesaler). All Rights Reserved.